DotA was introduced to Chennai in 2005 when Zap was the lone gaming café here & the Zap DotA tournament was the World Cup for Chennai’s DotA fanatics. Zap conducted monthly DotA tournaments back then and DotA was quickly gaining popularity. By this time, Mumbai probably had more tournaments in DotA. But none of the international tournaments that took place in India had DotA. But still, gamers got attracted to DotA for what the game offered and for what it was. And it was simply a strategy based team game. 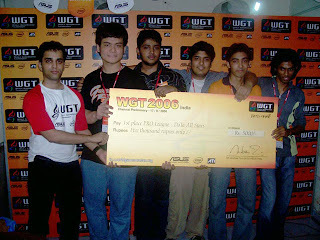 The Indian DotA community was in its nascent stages and most of the players connected through Hamachi or Yawle networks to play online. Indian DotA tournaments weren’t famous enough to upload the replays online & so, the gamers had just began to watch international replays & were getting introduced to the concept of combos. And speaking of combos, Chennai’s first formidable combo was devised by ‘Agents’. Agents were Zap’s premier clan. Regardless of which game it was, Agents were the top contenders for any gaming event in Chennai. In those days, Agents were famous throughout India was a Counter-Strike clan from Chennai. The mastermind behind the team was Jai “Burn” Prasad and was led by Yunsung. Their combo consisted of Treant played by Zaki “Ghillli”, Sniper played by Immortal, Earthshaker Narayan “Yunsung” and Omniknight played by Burn. Treant would get a refresher if the opponents had the slightest chance of victory, else, will simply get Radiance & finish the game. The combo was fairly simply even for that time. Earthshaker with dagger would initiate with his ultimate, Treant will use his ultimate at the same time & sniper would’ve farmed enough to kill them before they could reach any closer. And this, no team could challenge. This is when a team called ‘Guardians’ led by Ganesh “hunt3r” started to take part in the tournaments. Guardians were a newly formed clan that started playing Counter-Strike until they were visited by an old friend from Mumbai near the end of 2005. Ganesh, having spent a few years managing a gaming cafe in Mumbai returned to Chennai bringing with him, DotA. With his expertise and unique play style, Guardians, after a lot of failed attempts, started to challenge the Agents. This is when Burn was caught between work & play and the Guardians were starting to take control of DotA in Chennai. Teams started to take cues from international replays & Gdn went for the Clinkz with Rapier & Aegies along with SandKing using the ultimate & dagger combo. But it lasted only for a short while as then came ‘Roar’. If Zap was in the center of Chennai, Guardians were from the south of Chennai, then, Roar was from the north end of Chennai. Roar masterminded by Abhinav “DemiGod” Subramanium took control of the gaming scene in Chennai as soon as they entered the arena in the second quarter of 2006. They came at the right time as International tournaments started to accept DotA. Abhinav known of his infamous micro with Chen and Anthony “Medi “ Chang known for his farming abilities & gameplay were the aces for 0mF. Their combo of Enchantress with HoT as tank and Omniknight for support was unbeatable at that time. Very few matches went competitive against Roar, whether it was Gdn or Agents. 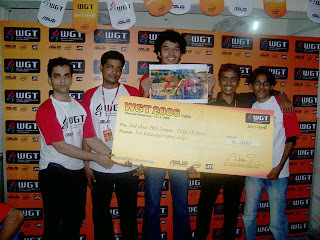 Then in September came WGT 06, the final showdown in Chennai. DotA was in its peak in Chennai at that time & all the 3 clans practiced to the max. Two weeks before the tournament, Ganesh of Gdn quit gaming. Since he was the mastermind behind the team, Gdn was out of the race for WGT. Only half the teams in Chennai competed in the event since the best players from smaller teams joined together to form competitive teams. The top teams were ‘Agents’ under the name GO, ‘0mF’ who were back then known as Roar, ‘Birds’ who are like 0mF2 & finally Gdn. GO lost a match against Roar in the preliminary stages. The final was between Roar & GO. GO won the first match, but lost the next one & so, 0mF (Roar) won the event. And with that grand finale ended the golden era for DotA in Chennai. After WGT 06, the teams changed. Roar became 0mF by removing Rahul from their line-up & taking in Ben from Birds instead. Jai quit competitive gaming & got employed. Ganesh from Gdn never returned to gaming. And to top everything, there was not a single national/international gaming event in Chennai throughout 2007. Therefore, everyone turned to the internet. DotA players throughout Chennai went online & connected through Garena. Even Zap made facilities to use Garena. The number of players doubled and tripled, but the number of competitive teams remained the same. With the absence of players like Jai & Ganesh, the team 0mF didn’t have any competition. What good is a team without opponents? And thus, Chennai never reached that peak again. 0mF did its best to practice online but it wasn’t enough. Chennai lacked serious DotA LAN events and Agents dissolved their DotA division. Players from cafes around Chennai started participating in online events. Thus, the café players joined together to form teams. The teams that attended most events were ‘Gdn’, ‘0mF’ with players from Nyx, ‘Atl’ from Atlantis and a few other teams like ‘Dead’ and ‘Zion’. Along with the teams & players, the strategies too changed. Teams started to concentrate more on nukes and early game heroes. Warlock, Zeus and Spectre became the most sought after heroes in Chennai. After WGT 06, the only event that attracted players from other states was the tourney conducted by Nyx Café. A team from Hyderabad & Err0r attended the event. Two teams from Chennai (Gdn & 0mF) managed to get sponsored to attend the prelimis of WGT 07 in Mumbai. Besides these two events, the top teams were banned from the local tournaments and so, Gdn & 0mF were pretty much out of action. Zapak has started conducting 3 on 3 tournaments every week. Like the T20 in cricket, Chennai’s new DotA style is 3 on 3 & it is getting increasingly popular in Chennai. Any gaming CAfe Still Active in Chennai?? IF yes please leave a reply here with th adress.. Thanks. We offer the opportunity to play LAN games, either alone or with a group of friends, in a comfortable atmosphere with high-end, state-of-the-art components. If you've never played your favorite games with others in the same room you are missing out on a huge part of the gaming experience. Thanks a lot.. U come to any of these??? Not regularly.. By the way, there is a tournament at Rage cafe (in Annanagar, I think) tomorrow. There is one in Nanganallur called Zion but that's probably too far for you. There is a Zapak at Velachery. There are a number of cafes near Madya Kailash (Adyar). I don't think there is any cafe on the OMR though.. Adyar has three to four..
do anyone know about dota tournaments happening in chennai? On Sunday, 20-01-13. At.. PlaYer ! Each Team Entry Fee 1k And Match Starts From 1pm..
GAME DHABA in ANNAGAR near SBOA school... is an amazing gaming cafe with state-of-the art equipment ... amazing ambiance and great Speed.. best gaming cafe with such attractive prices... guys must visit.